Presentation: Team Jet-2k presents its prototype to Mondelēz International representatives. From left are RIT students Katherine Larson, Jo Qiao, Katie Buschmann, Erika Bushey, and Tayler Clow. Karen Proctor, professor of packaging science, wanted to give her students a taste of the packaging design industry before they graduated. She realized that if she provided collaboration that mimicked the real world, her students’ designs could potentially be improved. “I found our packaging students, of course, did the structural design stuff fine, but the graphics and the industrial design aspects of packaging design is not in their skill set. They were structural people, and when they did their prototypes they weren’t complete,” said Proctor. She reached out first to graphic design and then industrial design. Through these three collaborative courses, Packaging Development, Packaging Design, and Senior Studio One, students are able to draw from the strengths of their peers in other majors and learn more about how the design process in the packaging industry works by creating designs for a sponsoring company. Dave Geier, the operations manager for the engineered laminations and coatings division at American Packaging, has worked with Proctor as a sponsor for the courses in the past and believes this collaboration is a great way to introduce the industry environment to students before they graduate. American Packaging is just one of the many companies that have sponsored the design challenge for these classes. 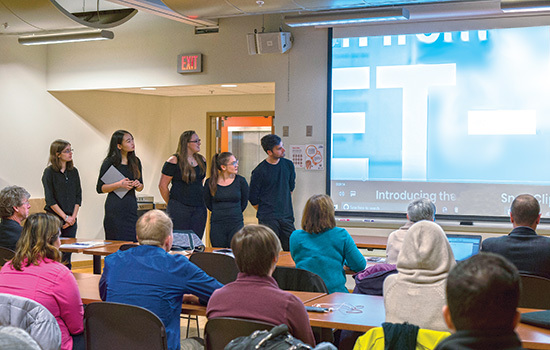 In the past, the classes have worked on design projects for Wegmans, Seventh Generation, Colgate-Palmolive, Unilever, ABVI, and others to design packages for products like laundry detergent, dish soap, juice, yogurt, and pasta. This year, the students are working for Mondelēz International, Proctor said. Five teams work on three projects for the semester, and each team creates its own prototype for each project. Jo Qiao, a fifth-year packaging science major, worked with a team to design packaging for the confectionery, food, and beverage company last fall. Being the only packaging science major in the group made her nervous at first, but after they started brainstorming ideas, her worries were put to rest. Erika Bushey, a fourth-year graphic design student and Qiao’s teammate, said that the different points of view offered by her teammates from other majors made their designs more unique and refined. “Usually in group projects everyone is an expert in the same field, so to have minds from different backgrounds think together to design something is really cool. You can bounce ideas off each other and you all have your own section that you can be the best at. You fill in each other’s gaps,” said Bushey. The team enjoyed working together and learning about the different design techniques each major offered. Tayler Clow, a fifth-year industrial design student on the team, said the most difficult part of the project was deciding on one final idea. Amy Gosselin, director for global gum and candy packaging at Mondelēz, was impressed by the work that came out of the classes and emphasized the importance of collaborating with students. “The projects we had students work on in this term are challenges we are actually having in Mondelēz, and bringing those challenges to this audience gives us the opportunity to really extract the creativity that students have and bring value to the company in a different way,” said Gosselin. Proctor and her colleagues believe that the biggest thing that contributes to the success of these projects is the inter-major collaboration. 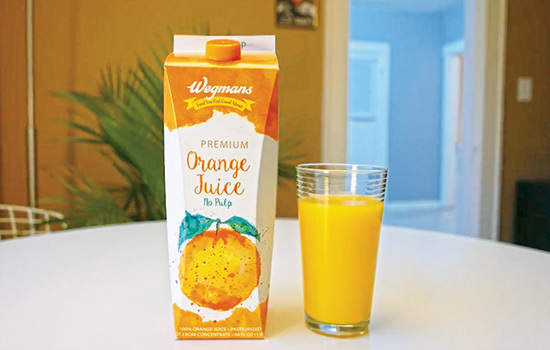 Sustainable Packaging: In previous years, design teams have collaborated with Wegmans to create more sustainable and unique packaging for Wegmans-brand orange juice and other products. New Design: When students create their prototypes, they must find ways to make their designs better than the current product packaging. 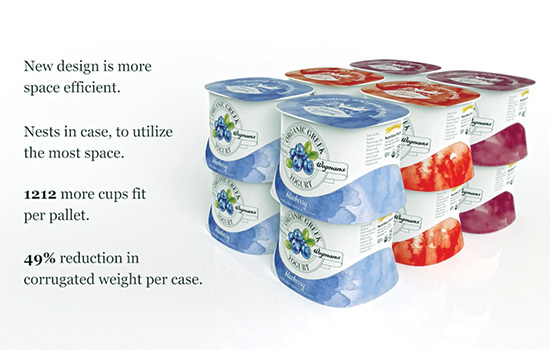 This student design makes it easier for Wegmans to ship and store the yogurt containers.